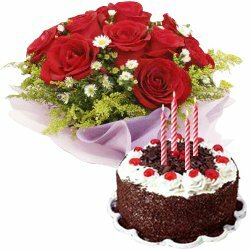 Send this faboulous combo gift to India to your loved ones with our Red Roses and Fresh Baked Delicious Black Forest Cake. These 12 Red Roses & 1/2 Kg. Black Forest Cake with Burning Candles are hand delivered to ensure freshness.